Michael McFadyen's Scuba Diving - SS Macleay The SS Macleay was a single screw coastal cargo and passenger vessel originally built by Forrest and Sons at Milwall (Millwood?) on the River Thames, London, England, for B.B. Nicoll in 1883 as the SS Woodburn. The Woodburn left England on 12 December 1883 and arrived in Sydney on 22 March 1884. It was 47 metres long with a beam of 8 metres and displacement of 398 tons. The vessel carried 28 passengers as well as cargo and was powered by a twin cylinder steam engine and sail when needed. Ownership passed to the Clarence and Richmond River Steam Navigation Company in 1884 and in 1889 or 1890 the ownership again changed when CRRSN Co merged with John Slee and Company to form the North Coast Steam Navigation Company. The name of the vessel was changed to SS Macleay. The ship had an excellent reputation on the North Coast run and was even famous in 1900 when it was involved in the rescue of 17 crew from the Harvester. On 9 June 1900 the Harvester had hit Big Seal Rock and the crew had taken to lifeboats and were drifting out to sea when intercepted by the Macleay. The ship had another minor incident in November 1906 when it collided with SS Tarshaw in Newcastle Harbour. There was not much damage. Another five years were to pass uneventfully until the night of 11 October 1911. The Macleay had by now stopped carrying passengers and was a pure cargo vessel. At 4pm on that day, the SS Macleay departed Newcastle for the Clarence River and Grafton with a cargo of coal, three horses and other cargo. At 7pm Captain Keith Donald "spoke" to the Port Stephens light keeper by signalling lamp and before he left the bridge, he gave orders for the vessel to head north-north-east. For some unknown reason, the officer on duty, Henry Goldsmith altered course to north-east. All of a sudden, the helmsman, Charles Petterson shouted that he saw breaking waves but Goldsmith declared it to be "a school of mullet..". Petterson attempted to steer away from the approaching reef but it was too late. The Macleay had hit Boondelbah Island. The weather was a strong southerly but it was apparently an otherwise fine night. The Captain ordered that the lifeboat be made ready. Already the ship was doomed, it had a list to port. The ship was apparently stuck on the rocks for a short while but it now came loose and developed an even worse list. The ship rolled completely on its port side and the crew and horses (which had been cut loose) went into the water. Within 10 minutes of hitting the island, the SS Macleay had sunk to the north of Boondelbah Island. The crew started dieing right from the time the ship sank. The 17 crew attempted to use whatever was floating to assist them but only two were to survive, Charles Petterson from Finland and William Swanney from Scotland. Mr Petterson had clung to a hatch cover with William Jones but Jones was lost when he tried to swim to Cabbage Tree Island as they passed to the south of the island. Mr Petterson was washed ashore to the north of Yaccaba Headland where he landed at about 9am. Mr Swanney was with two other crew, Hans Hanson from Norway and donkeyman E. Bogli (some sources also state Fireman Thomas Monks was with Mr Hanson) and they floated on a raft made from a plank, rope and other pieces of wreckage. Just before they reached land, Mr Bogli was lost from the raft (the same source as above says Mr Monks) and died and a few minutes later Messrs Hanson and Swanney swam through the surf towards the shore. Mr Swanney reached shore and looked back where he saw Mr Hanson standing in the surf but he was hit by a wave and swept back into the raging ocean. The bodies of Jones, Hanson and Monks were found that day on the beach as was a quantity of the ship's cargo, wreckage and the remains of a shark savaged horse. At the Court of Marine Inquiry, it was found that the accident occurred because the mate, Henry Goldsmith, altered course from north-north-east to north-east. Today the SS Macleay lies straight out from Little Island (to the north of Boondelbah Island) facing the south west, broken into two pieces just behind the engine. The GPS reading for the Macleay is a latitude of 32º 42' 20" S and longitude of 152º 14' 43" E. Note that all the GPS Readings on my Web Site are taken using AUS66 as the map datum. If you use another datum you may be about 220 metres off the wreck. See my GPS Page for more details and how to convert readings. See the diagram and marks at left as well as My Marks and GPS Page for more details. 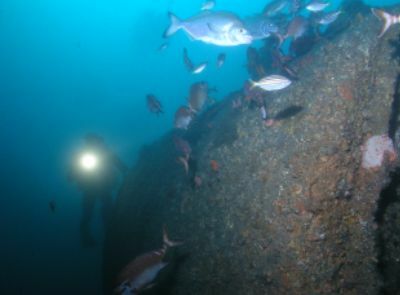 At 43 metres, the wreck is fairly deep. When I first dived the wreck a mooring was tied to the prop shaft immediately adjacent to the engine which is tipped on its side. However, in 2004 there was no mooring. The bottom is a jumble of small and large rocks, although to the east of the bow and north-west of the boilers there is sand. You are most likely to anchor near the boiler or engine. The wreck appears to lie north-west south-east, with the bow to the south-east. Swim to the north-west and you will pass the engine, keep going for now and you will see that the stern is very broken up. At the back of the engine you can see the prop shaft running back towards the stern. Despite what I said before, the stern is a bit more intact than other parts of the vessel but this is a mostly flat shipwreck. The shaft ends after about 10 metres and so does the main part of the wreck. Keep swimming and after 10 metres of swimming across the rocky bottom you will see the stern section. This consists of the remainder of the prop shaft, the rudder assembly and the propeller. The main section of the prop is buried in the little bit of sand that fills in the gaps between the rocks. Return back the way you have come and examine the engine which is lying on its side, the cylinder heads facing the south. A bit further you will see the single boiler, medium size considering the ship's size. Reaching up to about 39 metres, it is covered in growth and is home to some small moray eels and sometimes covered with red morwong, blue morwong and large bream. Off the starboard side of the boiler is the funnel and towards the bow there are the the remains of a hatch, a large winch and some bollards. At the bow itself there are two large anchors, located a little to the south. The wreck is even flatter in this area. On the northern side of the bow there is a large section of reef that extends up to perhaps 37 metres. The fishlife on the wreck is quite good, with giant cuttlefish, hundreds of red morwongs and huge schools of yellowtail floating over the wreck. I have also seen wobbegong, large bream, seapike and blue morwong. The visibility on the first time I dived was quite good, say 18 metres or so but my most recent dives had about 5 metres. There can be a current running in towards Port Stephens in between low and high tides and also a oceanic current at times. Visibility is dependent on the tides, generally far better at high tide. On my first dive the current make us use more air so the maximum bottom time I could do was 19 minutes. This entailed a two minute stop at six metres and 13 minutes at three metres. Unfortunately, the current had increased a bit and after 10 minutes of deco it picked up dramatically and made it quite uncomfortable. I have dived the wreck with Pro Dive Nelson Bay (other dives have been from private boats) and the service was first class. They do this quite regularly.